SEATTLE – Just 20 conditions make up more than half of all spending on health care in the United States, according to a new comprehensive financial analysis that examines spending by diseases and injuries. 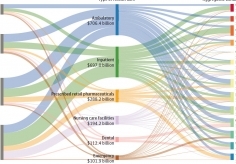 The paper, “US Spending on Personal Health Care and Public Health, 1996–2013,” tracks a total of $30.1 trillion in personal health care spending over 18 years. While the majority of those costs were associated with non-communicable diseases, the top infectious disease category was respiratory infections, such as bronchitis and pneumonia. Women ages 85 and older spent the most per person in 2013, at more than $31,000 per person. More than half of this spending (58%) occurred in nursing facilities, while 40% was expended on cardiovascular diseases, Alzheimer’s disease, and falls. Men ages 85 and older spent $24,000 per person in 2013, with only 37% on nursing facilities, largely because women live longer and men more often have a spouse at home to provide care. Less than 10% of personal health care spending is on nursing care facilities, and less than 5% of spending is on emergency department care. The conditions leading to the most spending in nursing care facilities are Alzheimer’s and stroke, while the condition leading to the most spending in emergency departments is falls. Public health education and advocacy initiatives, such as anti-tobacco and cancer awareness campaigns, totaled an estimated $77.9 billion in 2013, less than 3% of total health spending. 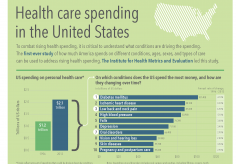 Only 6% of personal health care spending was on well-care, which is all care unrelated to the diagnosis and treatment of illnesses or injuries. Of this, nearly a third of the spending was on pregnancy and postpartum care, which was the 10th-largest category of spending. 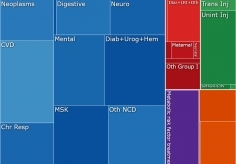 NOTE: To view personal health spending estimates, IHME has created an interactive data tool that can be accessed at the link below.